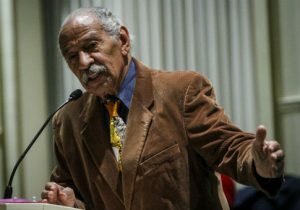 Democratic Rep. John Conyers (Mich.), currently the longest-serving congressman, denied on Tuesday that he ever settled sexual harassment claims, and specifically denied settling a 2015 complaint from a woman who said she was fired from his Washington, D.C. office after she rejected his sexual advances. BuzzFeed also published affidavits from former staff members who said they had witnessed Conyers touching female staffers inappropriately — rubbing their legs and backs — or requesting sexual favors. One former staffer said one of her duties was "to keep a list of women that I assumed he was having affairs with and call them at his request and, if necessary, have them flown in using Congressional resources." The AP went to Conyers' home in Detroit on Tuesday morning and asked him about the sexual harassment claims, prompting him to deny the allegations of inappropriate touching and say he learned about the story a few hours earlier while watching television. "I have been looking at these things in amazement," he said, referring to recent allegations of sexual harassment and assault being made against celebrities and politicians. BuzzFeed reported that the congressman's office did not respond to multiple requests for comment on Monday. Several of Conyer's former staffers told BuzzFeed they were frustrated by the complaint process on Capitol Hill and that it was not transparent. One former staffer said Conyers' stature in Congress made staffers "fearful to speak out." "I don’t think any allegations should be buried … and that’s for anyone, not just for this particular office, because it doesn’t really allow other people to see who these individuals are," said the former staffer. "When you make private settlements, it doesn’t warn the next woman or the next person going into that situation." Democratic Sen. Ben Cardin (Md.) said the accusations against Conyers are "extremely serious," but stopped short of calling for the congressman to resign. Instead, he said the complaints should be "dealt with in a very serious manner." Conyers is the second Democratic politician currently serving in Congress to be accused of sexual misconduct. A second woman came forward on Monday to accuse Sen. Al Franken (D., Minn.) of groping. The senator was previously accused last week of groping and sexually assaulting a woman in 2006.